Today was a holiday here in Canada. It’s still fairly new to us, so I don’t think people plan for it as much as other holidays. We didn’t really have any plans, anyway. 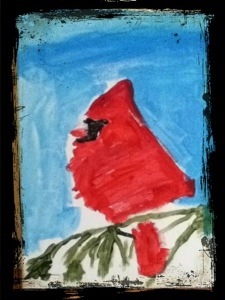 I spent this morning helping Becky finish her painting of a Cardinal. When I say help, I mean set up. I ask her what colours she wants and squeeze them out onto a palette. I make sure she has fresh water for her brushes, put the canvas on an easel, and so on. All the brush work is hers. After an early lunch, I headed over to Oakville, as I’d volunteered to spend an hour demonstrating Scottish Country Dancing. The Community Centre was packed. I mean bulging at the sides full. There was a steel drum band unloading their gear as I arrived. Burgers and hot dogs were being cooked outside, in -5 C, and there was a line-up for them. They smelt pretty good, actually. Inside was loud. A teenage jazz band was bringing down the house. We were supposed to be dancing next to where the band was playing. I saw my fellow dancers around the corner with their hands over their ears. Somebody was still in the dance studio so everyone was standing within ten feet of noisy brass instruments waiting to get into the room. A few more minutes and we were able escape inside. It’s not that the band was terrible, but in a confined space with a low ceiling, it was pretty hard on the ears. Everything worked out really well. We had lots of people show up, of all ages, ready to learn a little bit of Scottish dancing. This is not Highland Dancing, this is social dancing done in groups. 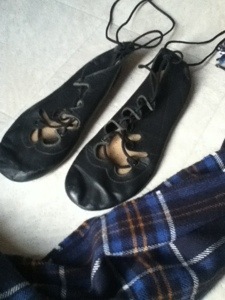 Think ceilidh dancing if you’ve ever been to one. We danced in circles, we danced in regular sets, and we danced in square sets. Everyone was smiling, which was what it was all about; having a good time. It was over very quickly, so once I’d put my winter boots back in, I drove back to Mississauga and had tea and cake with Becky. This entry was posted in Art, Canada, Disability, Family, Home, Life, Music, parenting and tagged Canada, Cardinal, community centre, dancing, disability, Family Day, holiday, life, Mississauga, music, Oakville, painting, Parenting, Scottish. Bookmark the permalink. Sounds like a pretty good day, Alicia. Someday I want to have tea and cake with you and Becky. It just sounds so nice. Some of the staff at Becky’s day program didn’t realize that they had the day off. I suppose we’ll all get used to Family Day eventually. Becky and I had a good time, anyway. Glad you liked the painting. I just hung it up this morning. It’s so cheerful. It was my first Family Day – a stat in February is a genius idea!!! Becky’s painting is fantastic – is it the cardinal from Lake Aquitaine? It used to be a long haul between New Year’s Day and Easter, and we had less statutory holidays than most western countries, so Family Day was born. Very odd. Hope you enjoyed it. well I am late in commenting and in Australia but I am working today..boring. I have to say I LOVE Beckys artwork, very impressive! Everyone has been so supportive of Becky’s art work. Thank you so much, and thank you for visiting.